Last week Felicia Fonseca of the Associated Press alerted me to a story that she was writing about a criminal complaint made by Anna Mae Silas, Gibson Namoki (BIA Police Officer), and the Hopi Museum. 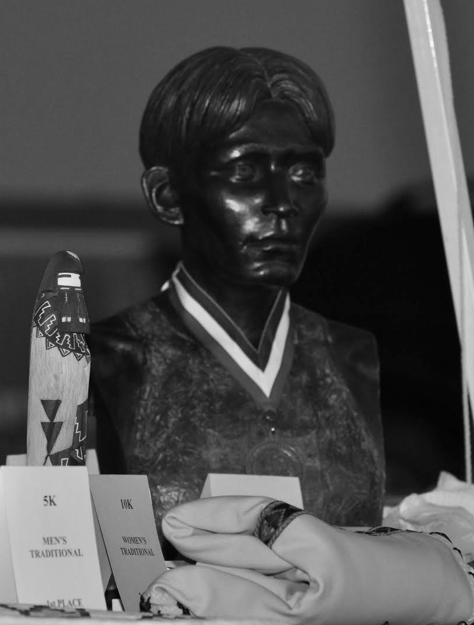 The complaint alleged that past Hopi chairman Benjamin H. Nuvamsa of Shungopavi had stolen a bronze bust of famed Hopi runner Louis Tewanima. Although I don’t know all the details in this case, I find it hard to believe that Nuvamsa would steal the bronze bust of his grandfather. In fact, the whole case seems a bit bizarre, and it leaves me with a lot of unanswered questions: What could Nuvamsa possibly gain from stealing this bust? Why did an individual – who appeared to be a Museum staff – help the former Hopi chairman load the bust in Nuvamsa’s vehicle, and then, six months later, assist Silas, Namoki, and the Hopi Museum in filing a complaint against him in Hopi tribal court? For those who have frequented Beyond the Mesas over the years, you know that I have a lot of respect for Nuvamsa. You also know that I greatly appreciate his activist work back home. Of course, it’s my hope that this will all be cleared up soon so that we can get back to focusing on Tewanima’s running legacy, and the inspiration his life and accomplishments have been for so many Hopi and non-Hopi people. To learn more about the allegations against Nuvamsa, read Fonseca’s newspaper article “Ex-Hopi chairman charged with Olympian bust theft”. See also Nuvamsa’s response to the allegations below. How Can It Be Theft? This is my response to the baseless “Theft” charge filed against me by Anna Mae Silas, Gibson Namoki (Bureau of Indian Affairs Police Officer), and the Hopi Museum on the alleged “theft” of a bronze bust of our famous Olympian, Louis Tewanima. Section 3.8.4 of the Hopi Law and order Code defines “THEFT” as: “A person who knowingly takes or controls the property or services of another person without consent of the owner or other proper legal authority, is guilty of an offense”. Here are the facts I intend to present in my defense. Louis Tewanima, from Shungopavi Village, was a great Hopi runner. He was an Olympian. He and the famous Jim Thorpe represented the United States of America at the 1912 Olympics in Stockholm where Tewanima won the Silver Medal in the 10,000 meters, setting a U.S. record for 10,000 meters. He also ran the marathon in the London Olympics in 1908. Louis Tewanima was inducted into the United States Olympic Hall of Fame; and to the Arizona Sports Hall of Fame. Tewanima is our grandfather. I grew up with him in the same house at Shungopavi. Every Labor Day, since 1974, we celebrate the accomplishments of my grandfather, Louis Tewanima, at the Annual Tewanima Footraces. See http://www.tewanimafootrace.org/ for more information about the annual Tewanima Footrace. Each year our families, and race organizers, would bring his trophies and pictures to the races to honor his accomplishments and for public display. A bronze bust of Louis Tewanima has been displayed at the annual races in recent years. Shortly before the 2013 races, I visited the Taylor family of Shungopavi (members of the Association and relatives of Tewanima) and inquired how I could help with the race. They talked about displaying the bust at the 2013 annual footrace. We agreed that I could help the race organizers by going to the Hopi Museum and obtaining the bust to be displayed during the 2013 footrace. I asked where the bust is kept and was told that it was at the Hopi Museum, at the Hopi Cultural Center. On August 29, 2013, during museum regular business hours, I went to the Hopi Museum to obtain the Tewanima bust on behalf of the race organizers. Anna Mae Silas was not there. However, her brother, Matthew Silas, Jr., was there tending to the museum’s business. Because he appeared to be “tending the store” and appeared to me as a museum employee, I told him the purpose of my visit. He said “Ok, it’s back here” and walked me over to where the bust was displayed. He said “It’s real heavy … let me carry it for you”. But I said, “I think I can lift it”. I picked it up and Mathew Silas opened the museum door and helped me load it into my personal vehicle. Mathew Silas never tried to stop me from taking the bust. He never told me I had no right to take it or that I was doing anything improper or illegal. To the contrary, Mathew’s actions, by showing me the location of the bust and helping me load it into my vehicle, indicated to me that I was doing nothing wrong, illegal or criminal and that the Hopi Museum, as it had in the past, was allowing the bust to be in the temporary possession of the Tewanina race organizers for display at the upcoming race. I then went to the Taylor residence and dropped the bust off at their house so that it could be displayed at the race. That was the last time I saw the bust. I had no criminal intention of stealing the bust or taking it without the museum’s consent. Had Mathew Silas told me not to take it, or that he would call the police, I would have left the museum without borrowing it. All appearances that day lead me to believe that Mathew Silas was an employee of the Hopi Museum and he allowed me to take the bust. When I explained to Mr. Silas the reason why I wanted to borrow the bust, he understood and showed me where the bust was displayed. In fact, he helped me load the bust in my vehicle. If I intended to steal the bust, why would I steal it in broad daylight, during museum hours while the museum was open, and in front of, and with the help of Mathew Silas, a museum employee, then drop it off at the Tayler residence for them to use during the race? If this was truly a case of theft, why did it take the Hopi Museum, Anna Mae Silas, Mathew Silas, Jr., and BIA Police Officer Gibson Namoki six (6) months to file the criminal charge against me? According to the criminal complaint, the alleged theft occurred on August 29, 2013, yet, the Criminal Complaint was not filed until February 24, 2014 – six months later. Did it actually take the BIA Police, Hopi Museum, Anna Mae Silas and Mathew Silas six (6) months to investigate and decide that I had stolen the bust? Or, are there other ulterior motives and reasons for filing this baseless charge against me, and publicizing it to disgrace me in public? If I am to be charged with theft of the bust, then shouldn’t Mathew Silas, Jr. also be charged as a co-conspirator because he showed me the location of the bust, opened the museum entrance door as I carried it out and helped me put it in my car? receive word about these matters until I was contacted by news reporter from Flagstaff, and was asked to respond to the theft complaint and arrest warrant. I immediately contacted a lawyer and we arranged to quash and set aside the arrest warrant and the court would send me new summons where I am to appear in Hopi court on April 8, 2014. I will appear at every court hearing to fight this ridiculous theft charge. I only hope that the Tribal Prosecutor, BIA Police, Hopi Museum and Anna Mae Silas will come to their senses and find the courage and wisdom to drop and dismiss this ludicrous theft charge and save everyone (Prosecutor, Police, Court and me and my family) time, money, embarrassment and other tribal resources in pursuing a matter that has no supporting evidence or merit. Publicizing this baseless theft charge in the local, regional and national papers was only a futile attempt to disgrace me, but it now raises a lot of serious questions that must be answered. In closing, there are many good Hopi people that have stepped forward and offered to testify on my behalf, including witnesses who saw Mathew Silas, Jr. helping me load the bust into my vehicle; and members of the Louis Tewanima Association. 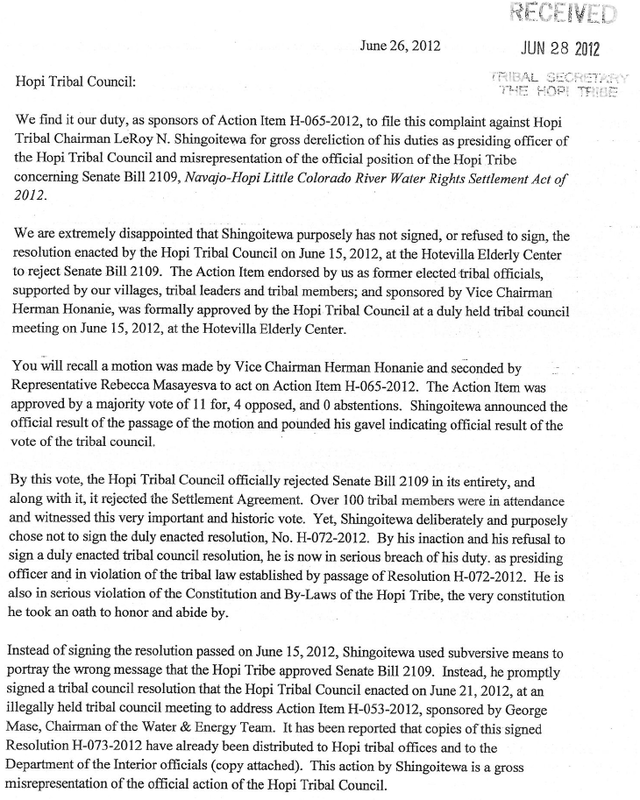 Below is a letter written by Benjamin H. Nuvamsa to the Hopi Tribal Council. This letter has been submitted to be published in the Hopi Tutuveni. Used with permission. The startling news coming out of the Hopi Tribal Council meeting this week concerns the $22 million that Leroy Shingoitewa and you, Hopi Tribal Council, allowed Robert Lyttle to rack up on 45 of his attorney friends. We understand Shingoitewa and Lyttle advised the tribal council to not worry because they will “pay the tribe back” when they win the lawsuits. And we hear there is another $12 million more in invoices that still remain to be processed. So why do you authorize the lawsuits, or do you? Is it so that Lyttle and friends can make money betting on the come that they will win the lawsuits? You know there are no guarantees that lawsuits will be won. The only guarantee is that Lyttle and his attorneys will get our money by racking up billable hours. And we lose. While tribal members were surprised and aghast at the news, I was not surprised. Not at all! For some of us have been writing letters to you ever since Leroy Shingoitewa came into office and brought Robert Lyttle to the scene – around May 2010. We advised you of the excessive billings and all the attorneys that Lyttle brought to the tribe without the benefit of tribal council approval (council resolutions) and without attorney contracts. We know how Robert Lyttle works. We know what he did to several Arizona and California Indian tribes. Maybe you were not getting our letters, or maybe you were simply ignoring our advice, but this matter has now exploded into a very serious situation where there may be federal criminal violations committed. And our financial position is now in serious question. Certainly, the Hopi people are not happy. We also advised you of the depletion of tribal accounts and the transferring of funds between accounts to pay the invoices because the other accounts ran dry. I advised you of the possible tax implications on the tribe (and Robert Lyttle and the attorneys). To this date, we don’t believe Lyttle has a legal contract with the tribe. Ask the question: is Lyttle and employee or is he a consultant? There is a big difference. Hard working and conscientious employees working in Finance have been summarily fired by Shingoitewa and Elward Edd for questioning the invoices. They were only doing their job. There are memos from Shingoitewa demanding the staff to pay the invoices. Our advice and complaints went into deaf ears. The Hopi tribal constitution is very clear. It requires that attorney contracts be formally approved by the tribal council, by council resolution. The constitution also says the Tribal Treasurer cannot spend any money from the treasury unless authorized by tribal council resolution. We assume you, as council members, are aware of these provisions in our tribal constitution. Because of our concerns about excessive payments to tribal attorneys and violation of tribal procurement policies by Shingoitewa, several of us exercised our right afforded us in the tribal constitution and requested to view the Treasurer’s financial records. As expected, we were denied our request so we filed a Writ of Mandamus in tribal court requesting the court to grant us access to the records. This matter is pending in tribal court. So, now you have a decision to make. Your duty as tribal council members is to watch over our money. This obligation is spelled out in the tribal constitution. You are our fiduciaries. I advise you to hold off making any payments on the attorney invoices until and when you have completed an exhaustive investigation into this matter. 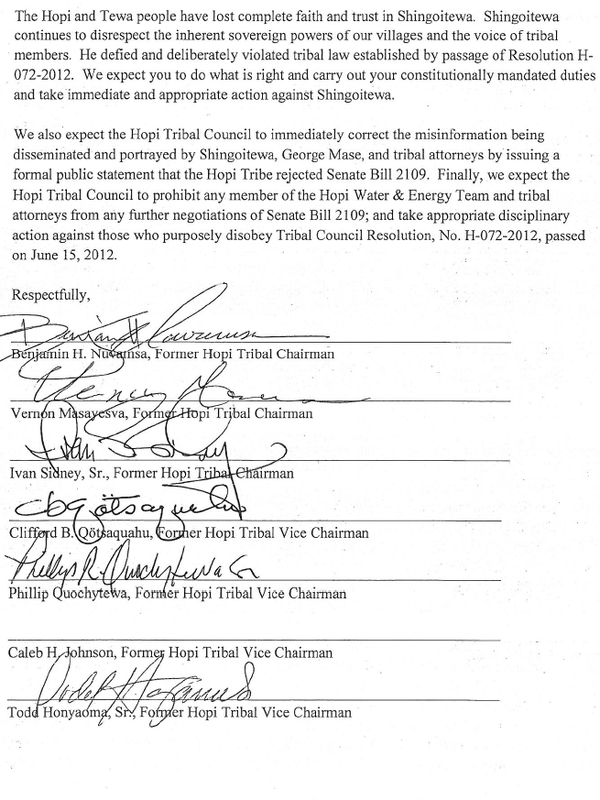 In fact, I encourage you to withhold action on this matter until after the tribal election. But the questions remain the same: Are there authorizing tribal council resolutions for each attorney? Does each attorney have a legal contract with the tribe? Does each attorney contract have an identified (and approved) scope of work? Do the invoices contain the required information on what services were performed? Tribal accounts need a good look to see how much has been taken out and what the remaining balances are. I understand a tribal employee asked you the same questions at the October 29, 2013, tribal council meeting. He knows what he’s talking about. We trust you will carry out your constitutional duties and protect our money; and hold people accountable.